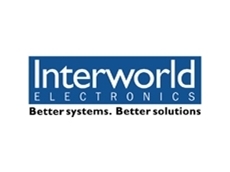 Interworld Electronics has released the RAK-314-600. The RAK-314-600 rack unit high industrial chassis is only 524 mm deep and can be mounted in several shallow depth racks. 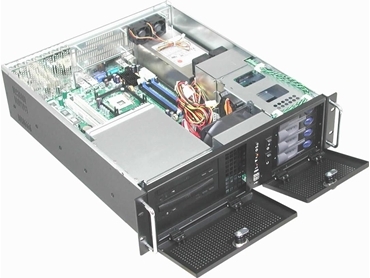 Designed for medium storage server applications the RAK-314-600 provides 4x3.5" swappable hard drive bays and 2x5.25" front access bays for optical or tape drives. The swappable drive trays can be supplied with support for SCSI-320, SATA or SAS hard drives. The front panel of the RAK-314-600 features two key lockable doors that restrict access to the swappable drives, optical driver bays and the power and reset switches. The RAK-314-600 supports ATX motherboards up 12" x 10.5" and is supplied with a 600 WAC power supply that provides enough power to run dual core processing platforms. A front mounted 12 cm 108 CFM filtered fan provides clean unrestricted airflow across the motherboard while 2x4 cm 15.3CFM fans cool the hard drive cage and additional 2x4 cm 15.3 CFM fans remove warm air through rear chassis ventilation holes. The fans ensure the chassis is well cooled and ventilated. The front panel of the RAK-314-600 provides LED indicators for power on/off, LAN and hard drive activity. In addition two front access USB ports are available for connecting peripherals. The RAK-314-600 is available from Interworld Electronics.